Finally, the first official 0.1 release of the Neos theme. The theme contains now all the icons for the new special folders handled by GWorkspace, following thus the enhancements of the standard theme. 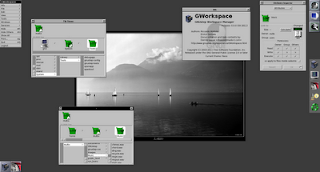 You need both the latest GWorkspace and Base for all of them to appear properly. 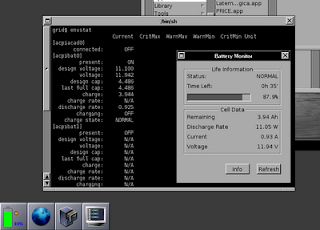 Use the GNUstep filesystem layout (with the standard /usr/GNUstep or even / as a prefix) for maximum enjoyment. 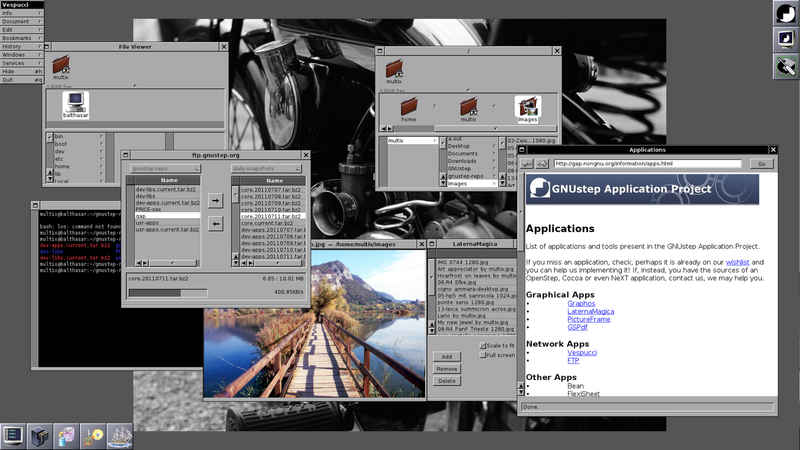 FHS has no real reason in a full GNUstep environment, in my opinion it should not be the default, it should just exist to ease people wanting to install one or two application in another environment. Name your folders Documents, Images, Music, Downloads. To have in idea of the look, check my past blog posts and you will see its evolution. Jobs died. Now He was not only the father of the Macintosh, the iPod, iPhone and the iPad. he was also the father of NeXT and thus our guide too, our uncle or step-father. Custom icons for special folders (System, Library, Images, Music, Documents, Downloads, Desktop). Themable. Volume recognition ported or improved on NetBSD, FreeBSD, OpenBSD. Many fixes in the build system, crash & security fixes. 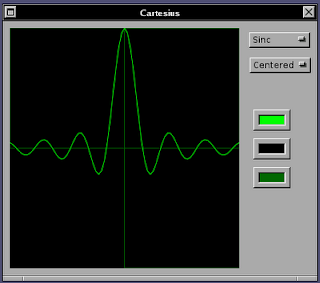 OresmeKit now is capable of plotting two function each against the other in its Cartesian view. I ported OresmeKit and its examples to the Mac without any major effort, as expected. I started creating OresmeKit, a plotting and charting framework for Objective-C, GNUstep (and Cocoa/Mac). I had the idea since quite some time, but finally started working on it. I know others had sketches on the subject too, but at the end one does need to start somewhere. The Kit will offer custom Views to be embedded inside your application to plot data. The goal is to have simple setup possible. Plotting is a complex art which can be tweaked quite a bit and which can lead to interesting mathematical computations, but let's start with something simple and easily usable, or the design will never go beyond the drawing board. The first component is a Cartesian plotting: two X and Y array need to be provided for abscissa and ordinata values. 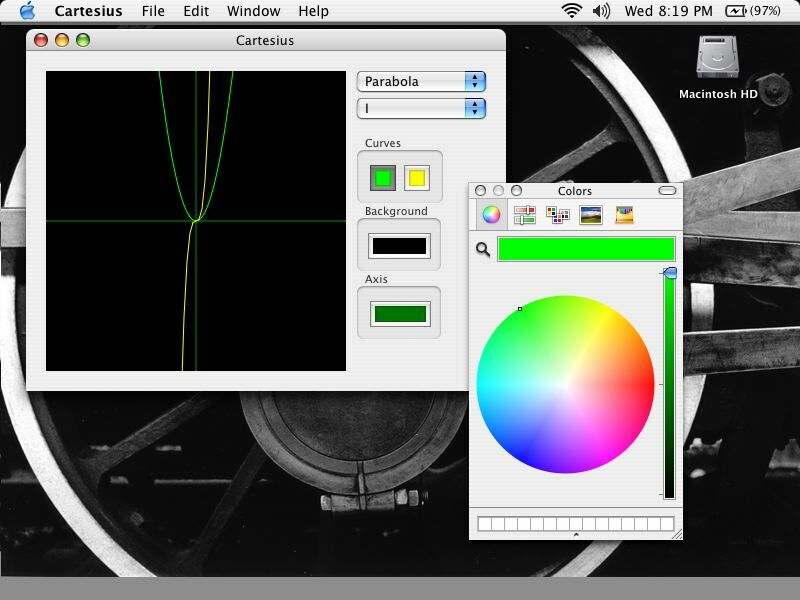 The view can be set to display different X/Y ranges, the Quadrant can be selected and a "centered" mode is available to automatically set the Origo in the center. The View live-resizes and the plot colors can be set. 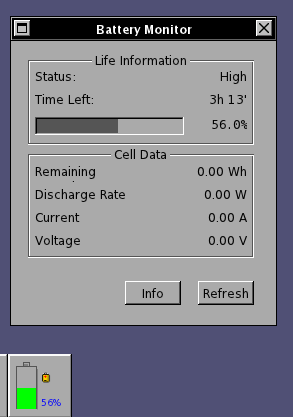 Currently there are no optimizations of any kind, but for simple graphs it works quite well, as the example application shows. Along with the Framework I develop and release also examples which serve the dual-purpose of testing the Kit and providing a starting point for other developers who want to use OresmeKit. In the screenshots, the example application plotting a parabola and the plot of the sinc(x) function. Why OresmeKit? In honour of Nicolas Oresme the antique philosopher who thought about coordinates long before Cartesius. Because Cartesius was too predictable as a name and too tied to X-Y plotting, while OresmeKit shall support more chart types in the future. What's next? 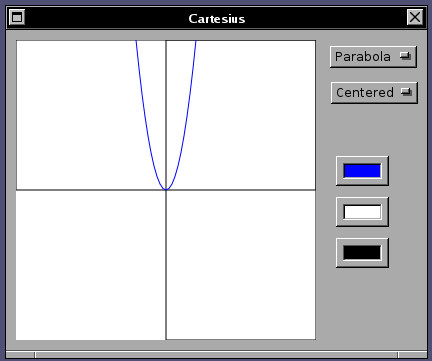 I plan on adding some more features to the Cartesian drawing view first. Then typical charting views: bars, lines, pies... At some point some optimization and computation will be available, since otherwise plotting of large datasets will be unbearably slow. 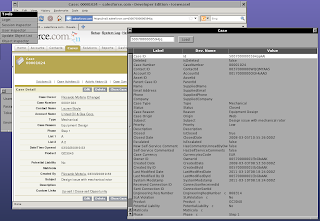 OresmeKit and its examples are available in GAP and are yet unreleased, check the CVS repository. 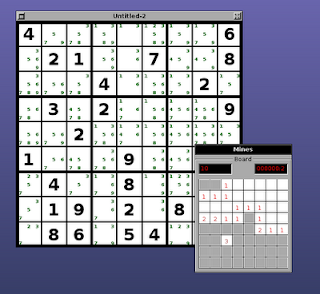 During the weekend, I rewrote the whole graphics core of GMastermind to use NSBezierPaths instead of PS operations. 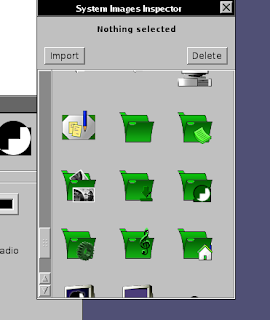 Furthermore it uses a gorm file to create the menus and instantiate the application Controller. With these changes, a port of the code to Cocoa is possible! 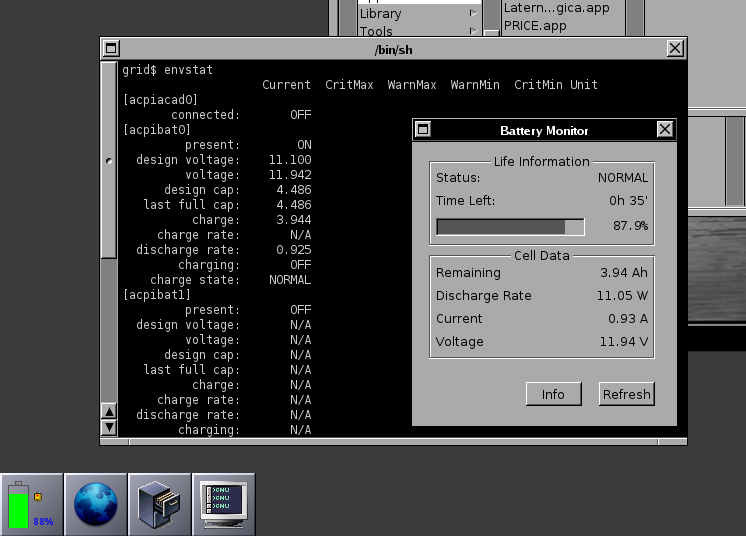 The screenshot shows the game running on my iBook with 100% the same code base of GNUstep. 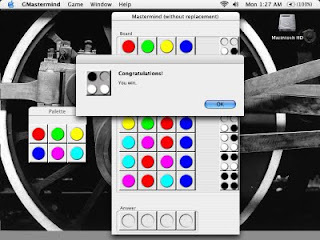 Furthermore, LapisPuzzle was released too. These are maintenace releases which make the application work on current gnustep, fix bugs, improve memory handling and improve porting to different platforms, including windows. Many thanks to the original author Marko Riedel who helped the code not fall into oblivion and Sebastian Reitenbach whose idea was to import the apps and who helped fix them. I got a first-generation iBook, those cute tangerine clamshells. Already owning a clamshell iBook, the lime SE version, which runs MacOS Panther, this one had to run GNUstep. I installed Debian/ppc, installed GNUstep and about everything seems to work quite smoothly, I see no extra problems compared to x86. You can see a busy desktop exported to a bigger display. GMines 0.2, the GNUstep version of the mine field / minesweeper game, got released. It is the first of several applications written by Marko Riedel that were salvaged and subsequently updated and bug-fixed by the GNUstep Application Project. The fields are now sortable by Label and Developer Name. A little feature that was sorely needed within orgs with almost 500 fields per object! This feature is currently not available in GNUstep. 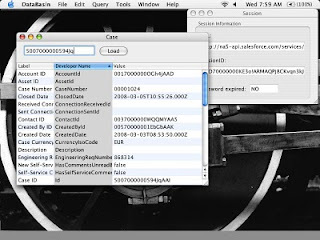 DataBasin, Objective-C portable data access tool. 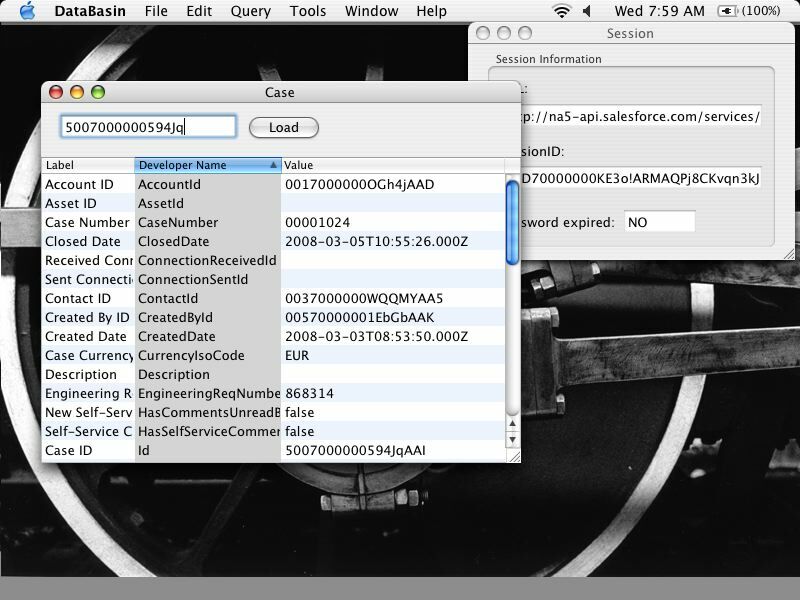 DataBasin now sports an Object Inspector which works in the easiest way possible: insert a SalesForce.com ID: DataBasin will try to attempt do determine the object type, automatically describe it and finally load the data. How many times did you have the need to quickly inspect an Object of which you got the ID in an exception email? Or how many times did you have to inspect the value of a field not visible on the layout? This new feature required some extension to the underlying API of DB: the Soap class now has an identifier method which looks for an ID in all objects returned by the Describe Global in the attempt to identify the object it comes from. The coolest addition however is in the DBSObject class itself: it is capable of loading or refreshing the values of a set of fields or of all known fields. And behold, a finesse: when loading the value of all fields, the queries will be split into executable queries without reaching the maximum SOQL size of 10K chars, as opposed to Apex Explorer which chokes if you select all fields of a very big object.